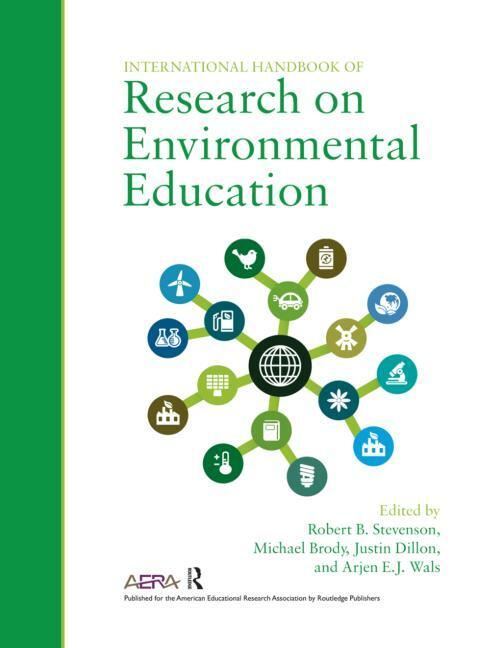 2013 marks the year in which the world’s largest and most diverse educational research organization – the AERA – jointly with Routledge, published the International Handbook of Research on Environmental Education (Stevenson, Brody, Dillon & Wals, 2013). The field of Environmental Education has roughly existed for just under 50 years and has over time developed its own research, research networks and research journals. The AERA commssioned the editors in 2009 to compile this Handbook as a part of AERA’s Handbook Series on Education Research. The International Handbook of Research on Environmental Education describes the important concepts, findings and theories developed by the research community and examines the historical progression, current debates and controversies, missing elements from EE research agenda, and the future. The environment and contested notions of sustainability are increasingly topics of public interest, political debate, and legislation across the world. Environmental education journals now publish research from a wide variety of methodological traditions that show linkages between the environment, health, development, and education. The growth in scholarship makes this an opportune time to review and synthesize the knowledge base of the environmental education (EE) field. The purpose of this 51-chapter handbook is to illuminate the most important concepts, findings and theories that have been developed by EE research and critically examine the historical progression of the field, its current debates and controversies, what is still missing from the EE research agenda, and where that agenda might be headed. The Handbook can be order through Routledge or any on-line bookseller. Here’s a link to the Routledge Handbook page which also contains the Table of Contents. Should you be working for a university you may want to recommend the Handbook for you library.